Cherry Mobile has yet again unveiled the next Fusion tablet. This time it calls for the element of water - the Fusion Wave. The Wave is at par with the screen size and RAM of the Fusion Wind that was released not more than a couple of weeks ago. The specifics are the 8-inch screen and the 1GB RAM. The local fruit company marketed this device to be carrying a quad-core Samsung Exynos Processor running at 1.4GHz frequency which somewhat created a buzz on their Facebook page. The only deal breaker would be the the outdated version, Android 4.0 (Ice Cream Sandwich). I mean, this goes out of the Jelly Bean trend that Cherry is releasing nowadays. Other features include a stunning 5100 mAh battery, HDMI output, USB OTG support and two 2MP cameras. 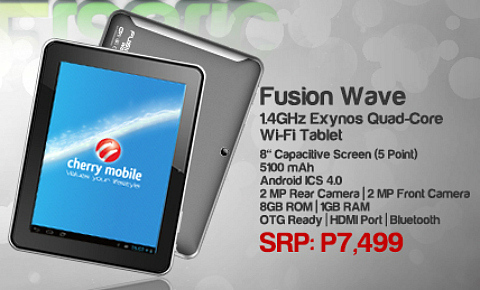 The Fusion Wave will be available soon with Php 7,499.